What should I know about mediation for family law cases? Going through a divorce is something that can be complicated. Going through mediation is one option that you might need to consider when you are going through a divorce or any other family law issue. Knowing about the process of mediation might help you to decide if it is right for your case. Mediation is a process in which you and your ex work together to work out the terms of your divorce or other family law issue. The process includes an impartial third party who is called the mediator. You and your ex must both agree to use mediation. Mediation in family law cases might be court mandated. What are contraindications for mediation? Since mediation is a collaborative process, it won’t work if either party doesn’t want to actively participate. If either party has a reason not to settle, the process likely won’t work. What happens if mediation doesn’t work? If mediation doesn’t work, you will have to go through the court process. Generally, having to go through court is more expensive and more time consuming. These are two of the main reasons for trying to work things out through mediation. Do I need a lawyer for the mediation process? When you go through mediation, you have the option to have an attorney present. The decision about whether to have an attorney present or not is up to you and your ex, as well as your legal representation. Understanding the mediation process is vital if you are going to go through the process. Before you meet with the mediator, you should make sure that you know what points you need to stand firm on and those you are willing to negotiate about. Hi, you may just be browsing, but we are available to answer your questions. Can we help you? 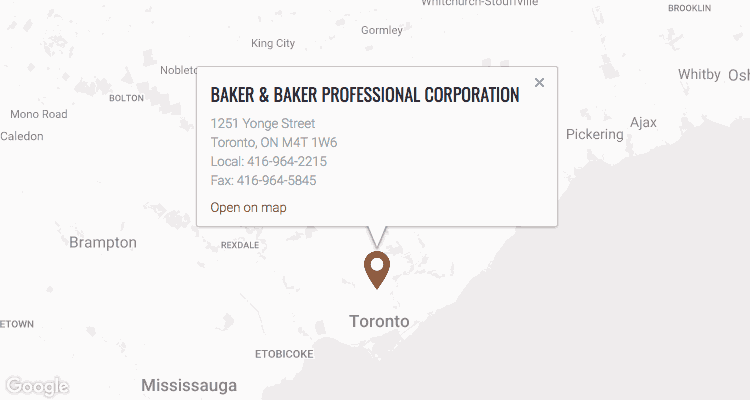 Baker & Baker serves individuals and families throughout the Greater Toronto Area, including downtown Toronto, North York, York, Mississauga, Markham and Vaughan. © 2019, Baker & Baker Professional Corporation. All rights reserved.